excellent seal with captive closure, good for storing electron microscopy grids, specimens, etc. 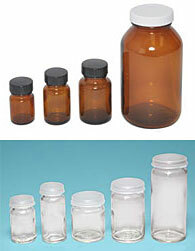 One piece molded polyethylene vials to store non-volatile liquids or solids. Moisture proof. The smallest vial (Prod. No. 21441, see cross section) holds one EM grid and has a rounded bottom to prevent grid from laying flat. Made from PTFE, designed to hold 18 conventional polyethylene microcentrifuge tubes. 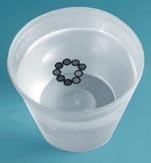 Firmly holds tubes in water bath or on PELCO ColdSpot® Pro during processing. The Floating Tube Rack provides versatility in specimen handling which can be a valuable resource for any pathology and research laboratory. 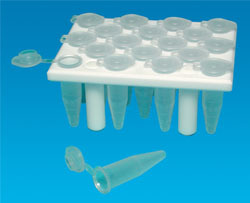 The rack is composed of polypropylene and allows the submersion of the sample tubes to assist in temperature regulation. The legs of the rack are detachable, offering versatility in use on the bench or submerged. 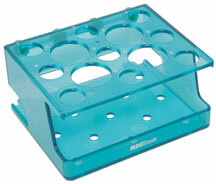 The Floating Tube Rack has the capacity to hold 20 (round) and 16 (square) microcentrifuge tubes (1.5 – 2.0ml). The unique locking tabs keep the tubes secure while immersed. The microcentrifuge tubes can be easily removed by pushing the rack down onto the bench top surface. The 1.5ml microcentrifuge tubes are manufactured from polypropylene and able to be autoclaved. These tubes are also microwave transparent. 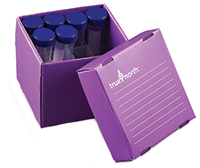 The tubes feature a frosted label area for sample identification and volume graduations of 0.1, 0.5, 1.0 and 1.5ml. The microcentrifuge tubes have a snap cap for secure closure but are also syringe pierceable. These microcentrifuge tubes offer convenience and versatility for various utilizations in histology, immunology and scientific research. The 1.5ml microcentrifuge tubes are composed of polypropylene and are completely autoclavable as well as microwave transparent. The opaque black provides protection for light sensitive samples. 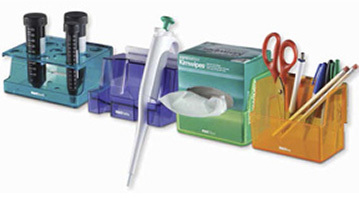 The microcentrifuge tubes offer a frosted label area for writing or moisture resistant labels. The tubes contain volume graduations of 0.1, 0.5, 1.0 and 1.5mls. The tight-fitting snap cap offers convenience and safety in storage as well as a syringe-pierceable alternative. These microcentrifuge tubes provide versatility and convenience in many facets of histology, immunology and scientific research. These 1.5 ml microcentrifuge tubes in assorted colors consist of polypropylene, are microwave transparent and autoclavable. The frosted label provides are for specimen identification. The tubes are labeled in graduated volumes of 0.1, 0.5, 1.0 and 1.5 ml. The tight-fitting snap cap offers secure closure and syringe insertion ability. 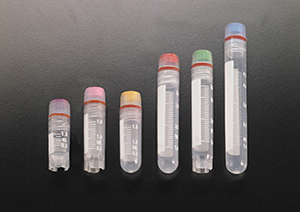 The assorted colors of the 1.5 ml microcentrifuge tubes provide assistance in organization and reference for multiple samples. These tubes offer versatility in specimen handling in histology, immunology and scientific research. These clear conical tubes are manufactured from high clarity propylene. 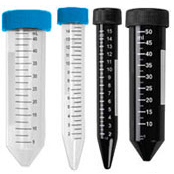 Both 15 and 50ml tubes offer a large white label area for sample identification. The conical tubes are imprinted with dark graduated markings for accurate measurement. All caps are composed of blue polyethylene. The 15 and 50ml conical tubes are packaged sterile and are RNase, DNase and Pyrogen-free. These sterile conical tubes provide a versatile addition to any tissue culture, clinical, immunology or research laboratory. The black conical tubes (15 and 50ml) are constructed of high grade polypropylene and designed for light-sensitive samples. 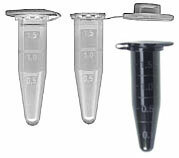 Both size tubes contain a large white label area for sample identification. The imprinted graduations are in white for assistance in measurement. The 15 and 50ml black conical tubes are packed sterile and are RNase, DNase and Pyrogen-free. These tubes provide a high quality alternative and light-sensitive protection for tissue culture, immunology, clinical and research laboratories. 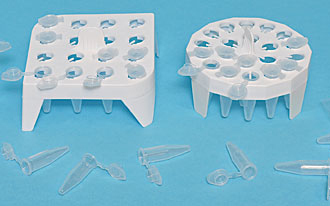 The Microtube Rack, constructed of polypropylene, offers 80 wells of microcentrifuge tube (1.5-2.0ml) handling in a solitary item. 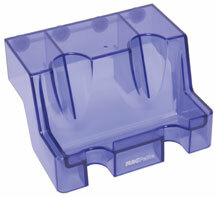 In an organized 5 x 16 array, this molded rack is stable and efficient for storage or bench top utilization. The wells are designed for secure seating of the microcentrifuge tubes. 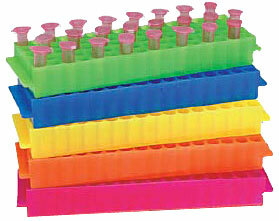 The Microtube Rack is autoclavable and comes in an assortment of vibrant colors. 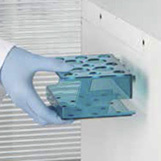 From freezer to bench top, the Microtube Rack offers diversity in sample handling for any pathology, immunology, histology or research laboratory. 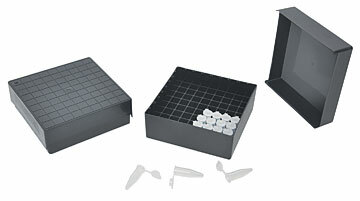 The Microcentrifuge Storage Box provides an organized and efficient method for storing 1.5/2.0ml microcentrifuge tubes. 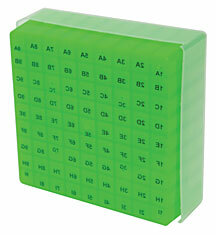 These polypropylene boxes have alpha-numeric reference guides permanently molded into the top edge of the base. Also, the close-up image of the bottom of the green box shows the alpha-numeric grid, printed in reverse, visible through the box when viewed from the top. The black boxes do not have this feature. The friction-fit lid (transparent for colors and black for black) has relief gridlines and reference points for easy specimen location and retrieval. The compact Microcentrifuge Storage Box has a capacity for 81 tubes and is designed to fit in standard freezer storage racks. To maintain safety and sterility, these bases and lids can be autoclaved. With storage at a premium for most clinical and research laboratories, the Microcentrifuge Storage Box provides a compact and organized solution. Economical, reusable and moisture resistant plastic boxes for freezer storage of tubes, cryovials, and mini centrifuge tubes. Freezer boxes are supplied “flat-packed” eliminating the hassle of stacking and reduces the amount of space needed for storage. Boxes fit in standard freezer racks. 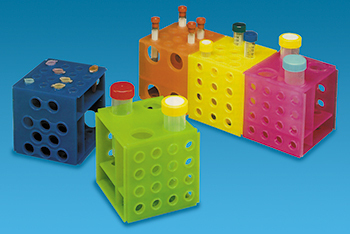 This solidly constructed Cube Rack is a must for any laboratory. It accommodates (4) 50ml tubes, (10) 15ml conical tubes, (12) 12 x 75 or 12 x 100 tubes, or (16) 1.5 - 2.0ml Microcentrifuge tubes. This rack is made of autoclavable polypropylene and slides together on any side, allowing the user to work with different tubes on as many connected racks as desired. Sold in packages of 5 assorted colors: blue, green, pink, yellow and orange. 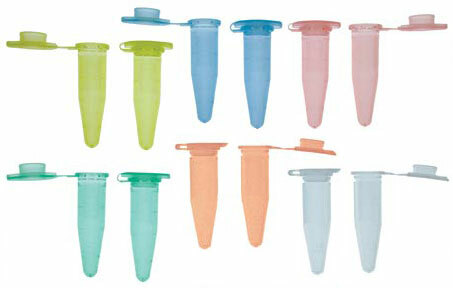 Polypropylene inserts which fit directly into the caps of the Cryovial® Tubes for unique color identification. Available in 5 individual colors or a case of assorted colors. Aluminum cane specifically designed for storage of Cryovial® Tubes. Each Cane is engineered to hold up to 5 of the 1.2 or 2 ml Cryovial® Tubes. Canes are for storage placement in liquid nitrogen dewars. Autoclavable to 120°C, 15psig for 20 min. 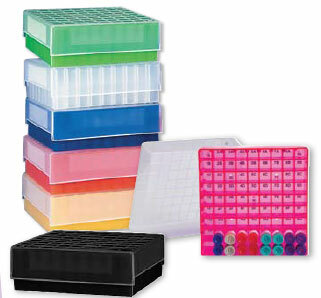 The Magnetic Storage System consists of 4 uniquely constructed and colorful ABS plastic container racks. wipes rack and box rack. Each rack is designed for utility and contains 4 powerful magnets that secure the rack to magnetic steel surfaces. 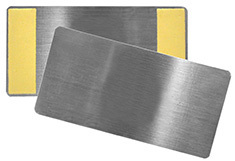 Included self-adhesive metal plates allow users to create their own holding point on any non-metallic surface. The Tube Rack can accommodate four 50ml conical tubes and nine 15ml conical tubes. Each Pipette Rack holds two standard size pipettors. 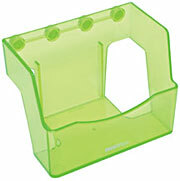 The Wipes Rack can hold a standard 110 x 210mm box of wipes. 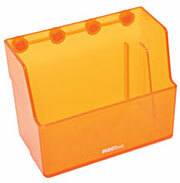 The Box Rack can be used as a container for pens, paperwork and general lab items. Racks are available as individual units perfect for customizing your laboratory or as a set of 4 for easy workflow organization. The Magnetic Storage System provides resolution to organizational and space-saving demands of busy research, tissue culture, pathology or histology laboratories. 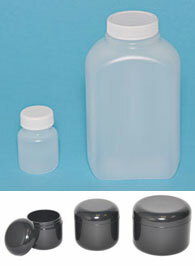 Introducing the world first leakproof, airtight, snap-top specimen containers for multiple laboratory applications. The built-in triple-seal design on the lid provides a leakproof, airtight construction ideal for pathology laboratories, transporting wet samples and storing (wet) samples. 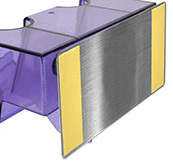 The permanent hinge and the snap-top design allows for one-hand opening and closing. Molded of translucent polypropylene. Available in a variety of sizes from 47 to 250ml. Additional locking latch for secure transport is available on the 120 & 250ml vials. All vials have a write on area for identification.